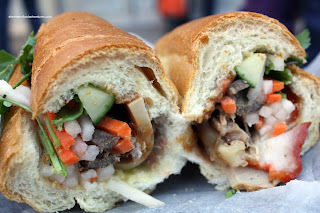 The Vietnamese sub, AKA Banh Mi, is one of my "go-to" foods. If I ever need a snack, it fills the void. When I need a meal, I just eat more than one of them. 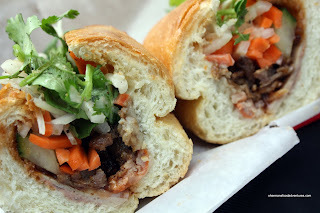 It's essentially a French Baguette stuffed with a variety meats mixed with cilantro, sweet butter, sometimes pate, pickled daikon/carrots, black pepper, hot peppers, cucumber and fish sauce. It may sound like an odd collection of ingredients; but once you give it a try, you may never go back to Subway or Quizno's. Considering they range in price from $2.75 to $5.00, it's a friggin' steal. Now, the most popular places to get these tasty sandwiches would be Ba Le, Tung Hing and Au Petit Cafe. 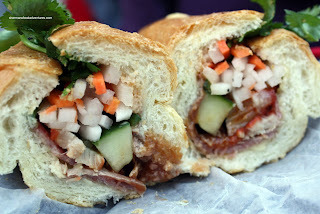 Unless you included the Chinatown location of Ba Le, there are few good Banh Mis to be found in Downtown. Well, assuming you've been paying attention, the whole point of this post is to inform everyone that Viet Sub brings the humble, yet tasty Banh Mi into the downtown core. Yes, there are other places you can get these; but the ones here at Viet Sub are actually good. Today, the whole family decided to take in the Olympic vibe in downtown and while we were on our way to try out Dougiedog, I stopped dead in my tracks when I spotted Viet Sub. Suddenly, I was reminded of what Kim blogged about last July. I recalled that he recommended it. And for him to recommend something, it must be good! He hates everything else... LOL... So Viv and I decided to share the Special Sub to try it out. To our delight, it was indeed quite good. Lots of ingredients and a nice smoky BBQ sauce which gave the meats a "char sui" taste. The bread was crispy and warm; yet a a bit too chewy for me personally. I still prefer the airiness of Ba Le's baguettes or the right-out-of-the-oven ones from Tung Hing. Not being satisfied with splitting one Banh Mi between the both of us, we returned later in the week. In fact, we braved a Friday in Downtown during the Olympics. Predictably, it was wall-to-wall people reminiscent of my visit to New York. I've never seen the sidewalks so full of people. This time, we got 2 more subs: BBQ Sub and the Cold Cut. Once again, both were doused with the same BBQ sauce from last time. It got a little boring because of it. Don't get me wrong, we love the sauce; but maybe only use it in the BBQ and Special sub, not the cold cut. Usually, the cold cut sub in any other Vietnamese restaurant would only have pate as the main flavouring agent. This way, you could taste more of the meat. 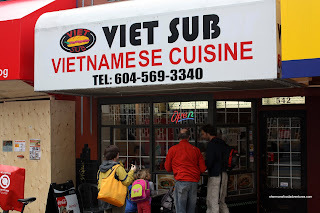 Whatever the case, we enjoyed the subs and concluded that this is the place to get Banh Mis in Downtown Vancouver. Yes, I was shocked how cheap the prices are considering they are located right on Robson! Crazy - I must have been subconsciously influenced by this post when I chose our place for dinner last night! Elaine, did you like it?